Besides the traditional wedding photos, the couple mentioned that they also wanted funny and creative images on their Roma's Hospitality Centre wedding. Long gone are the days when wedding photography was all about a list of poses. Today, couples expect fresh, creative and fun wedding photos. 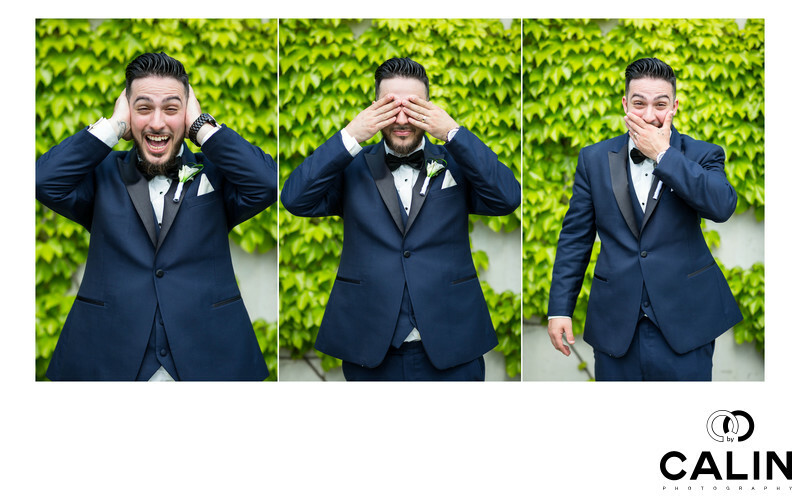 This album spread includes three portraits of the groom who impersonates the three wise monkeys. In the image on the left, the groom is covering his ears and screams. He is, and this shot, the monkey that hears no evil. As a side note, to make the image look more believable I asked the groom to scream. The second photograph shows the groom who sees no evil and the third image he talks no evil. Regardless of the creative nature of the shots, it was important for me to find a good backdrop for this triptych. As such, I placed him in front of a wall covered in green plants which created a stunning background for this wedding album spread. To capture the succession of images, I had to wait for the sun to be covered by clouds. The way the wall behind the groom was positioned did not allow us to bring our studio lights so we had to rely on the ambient light to illuminate the image. Fortunately, at this time of the day the sun was coming in and out of the clouds. I managed to take these three shots within no more than two minutes. To create these images I used the Canon 85 mm 1.2 lens shot at F2. In post production increased the vibrance of the images and added a vignette.